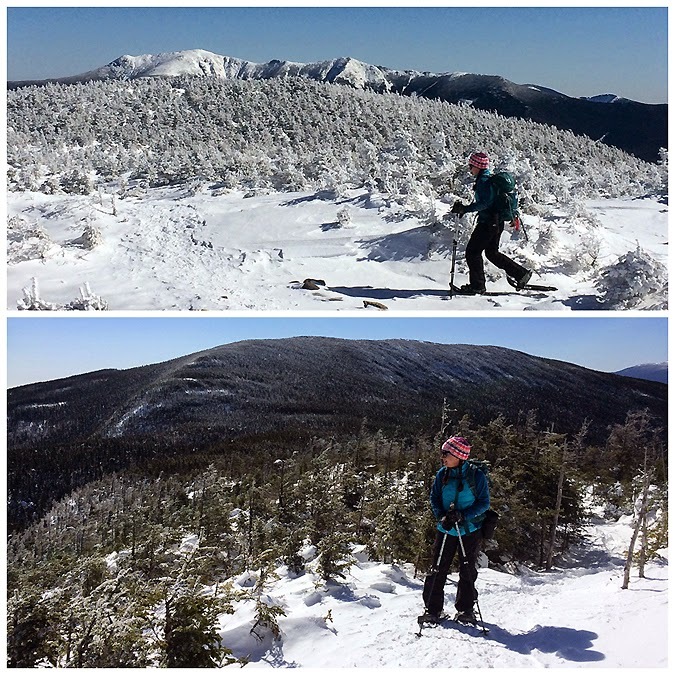 - With just two more weeks of 'official' winter hiking to go, Whitney and I are closing in on our Single-Season Winter 48 finish. 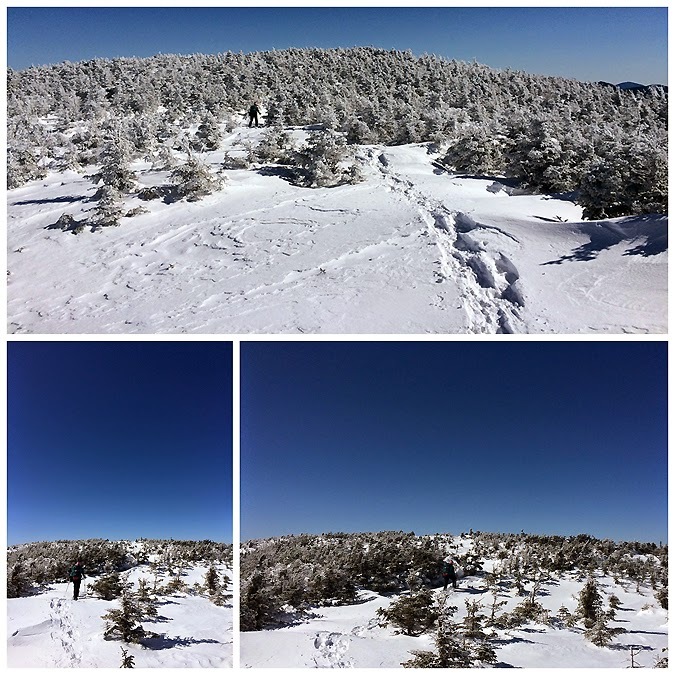 We both had yet to hike the Kinsmans this winter so we decided to quickly head up from the western side of the ridge under a cold but bluebird day. 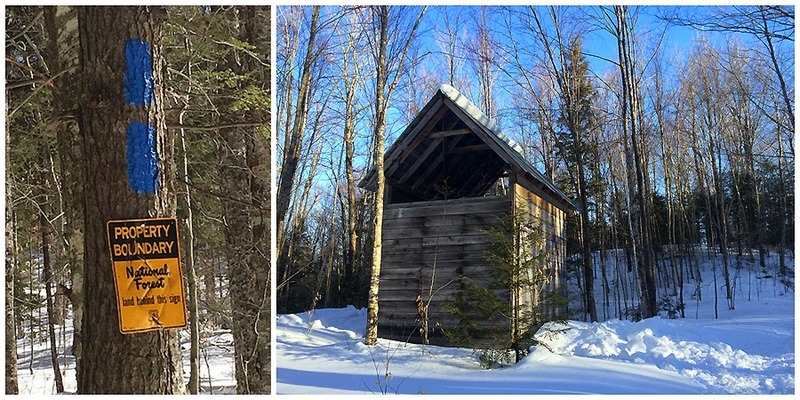 I have been on the North and South Kinsman about ten times but only once from the Mount Kinsman Trail off NH 116, back in 1993. I have no idea why it took me so long to get back to this trail as it is far more enjoyable and less crowded than hiking up to Lonesome Lake and then heading up the Fn' Jimmy Trail. - The temperature was hovering around zero as we started but there was absolutely no wind which made it easy for both of us to stay warm. 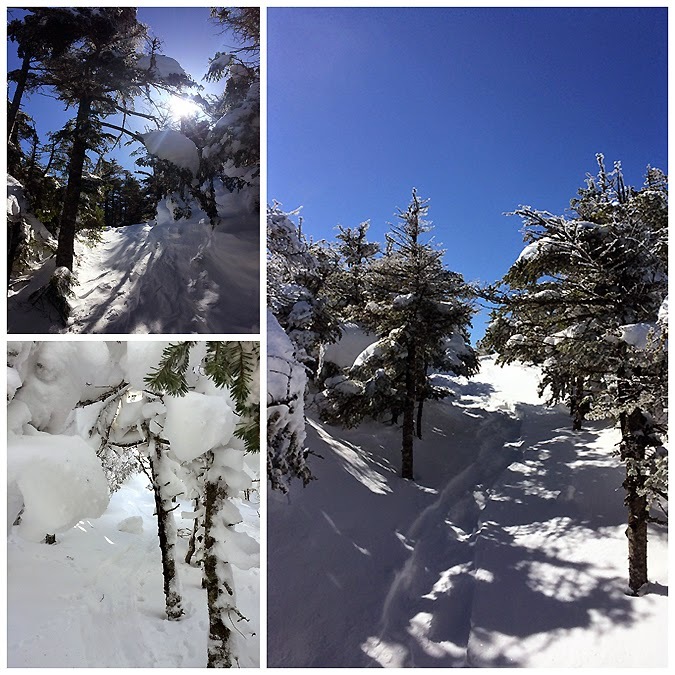 The trail was packed like a concrete sidewalk for the first mile and a half so Whitney bare booted and I microspiked it before strapping on the snowshoes. 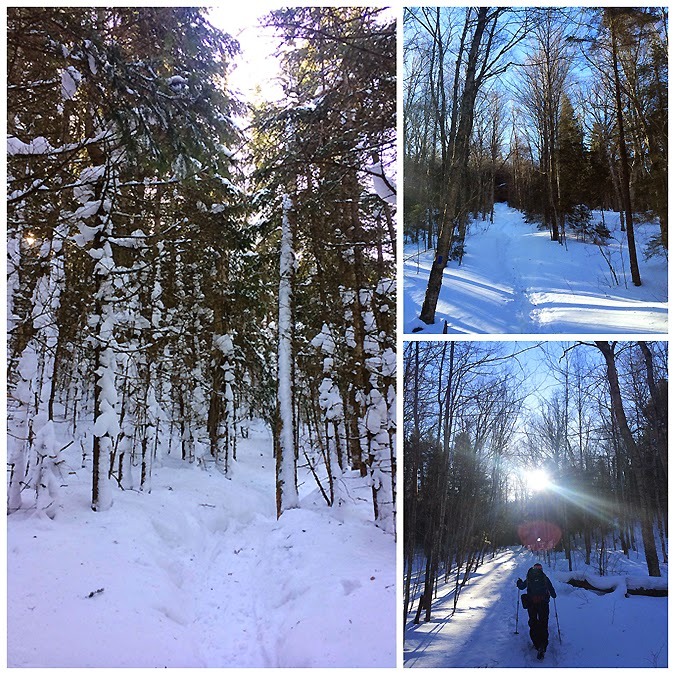 - The Mount Kinsman Trail has easy and moderate grades as it travels through the woods and over an old logging road for the first couple of miles. Along the way it passes by an old sugarhouse, a small cascade (unfortunately buried below snow), and a flume located below the spur trail to Bald Peak. 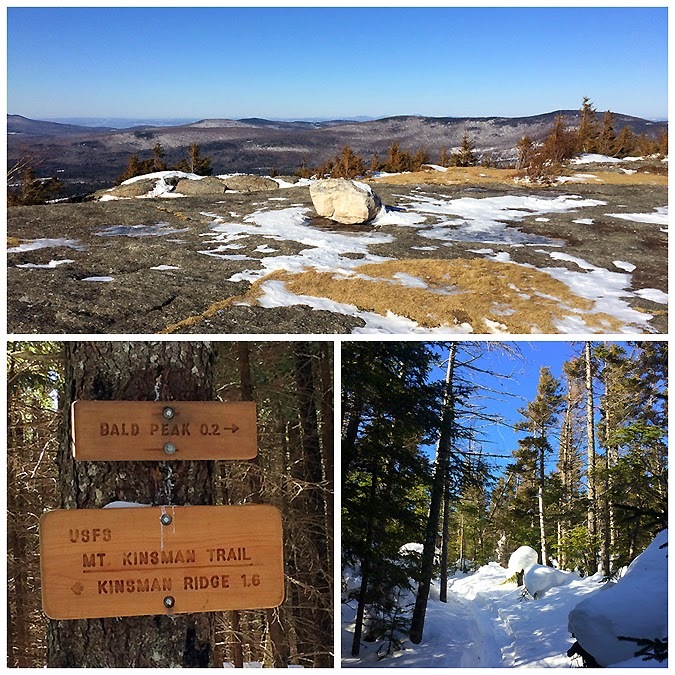 - We took the short spur path to Bald Peak where there are excellent views directly above to North Kinsman, north to West Cannonball, South to Moosilauke, and down to the town of Easton. 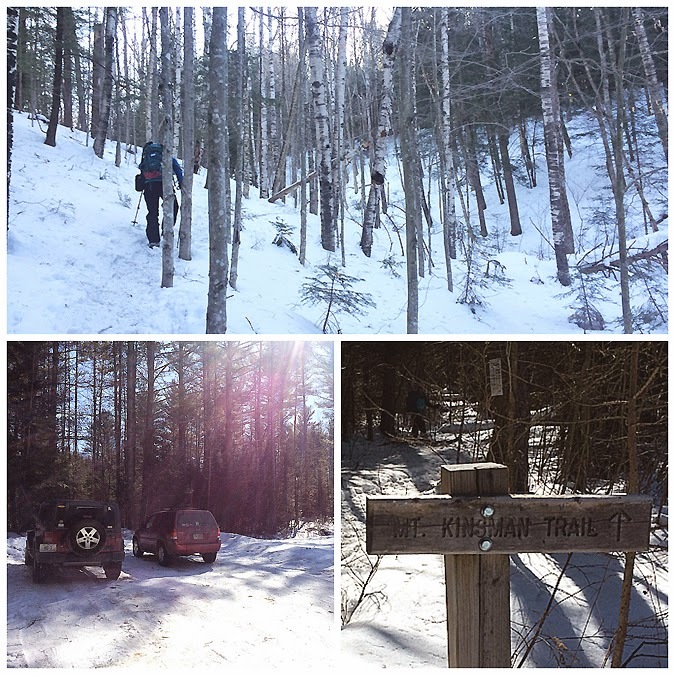 - Once back on the Mount Kinsman Trail we made the mile and a half push to gain Kinsman Ridge. 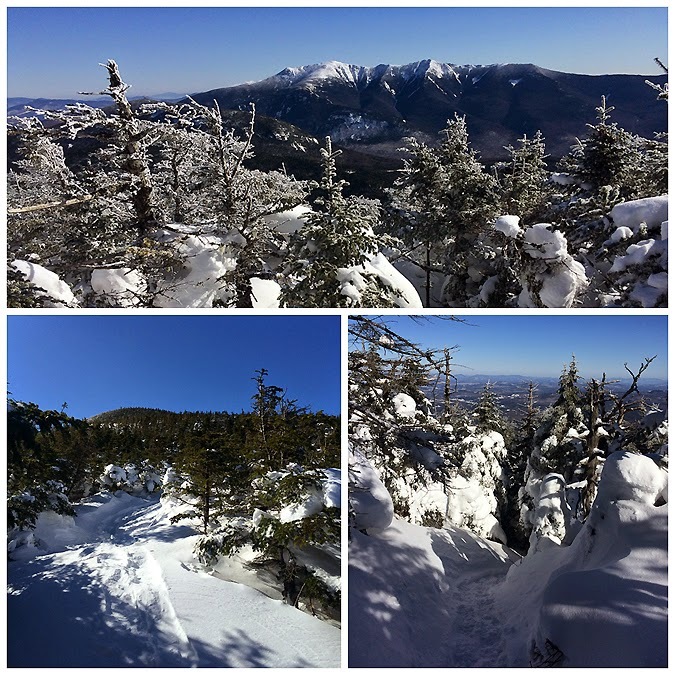 The trail is not too exciting as it goes back and forth from moderate to short steep stretches until it pops out on the ridge less than half a mile below North Kinsman's summit. - Usually there are no big views along the Kinsman Ridge Trail up to North Kinsman's summit, but with the snow depth so high there were pretty sweet views at certain spots and even a view from the actual summit to go along with the views from the downlook on the ledge just below the summit. - From North to South Kinsman is a pretty easy and tame one mile down and up, it's one of the easier hikes between two 4,000 foot peaks. South Kinsman definitely has the more impressive summit, as it is open with scrub surrounding it, but I still think the view from the ledge downlook on North Kinsman across to the Franconia Ridge has better views. - After taking a few pictures we scurried back over to North Kinsman, both getting chilled up a little. 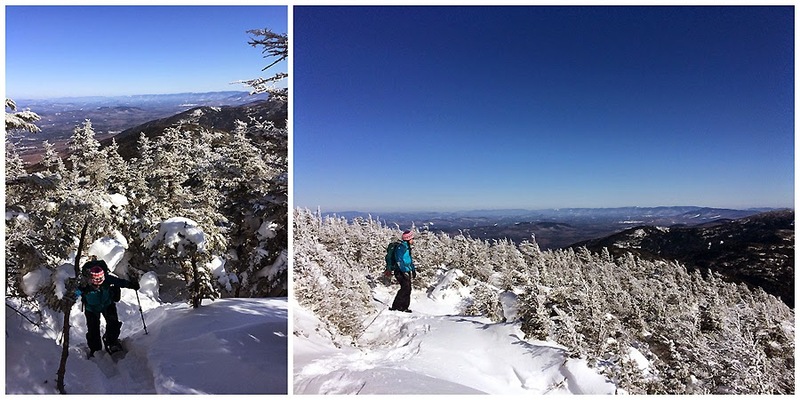 Whitney made an observation that the col between South and North Kinsman always seems ten degrees colder than anywhere else on the mountain and today it definitely felt that way. - The hike out was quick and pleasant and by the time we made it back to the car the temperature had risen twenty degrees from when we started. 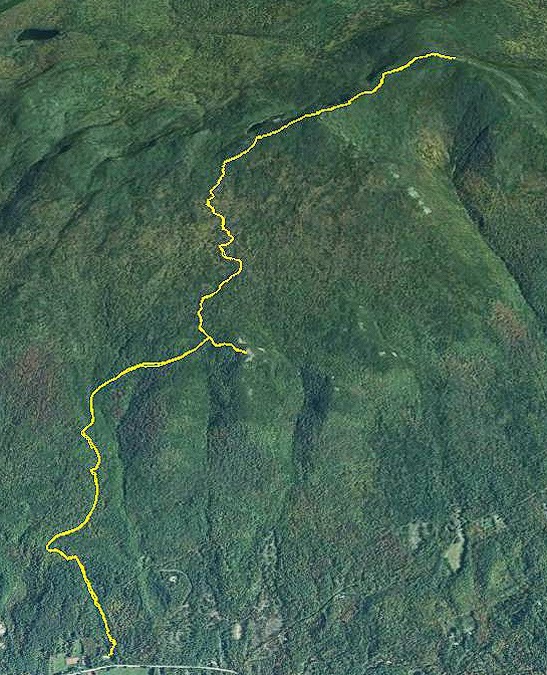 As usual it was a fun hike and from here on out I plan on hiking the Kinsmans from NH 116 and not Lafayette Place. The trail just seems a lot nicer in my opinion. Oh yes, I've been up that way twice and down once, sooo much water!!! Your pictures are great! Looks like you got a perfect day! Thanks, Beth! We sure did catch a great day with some nice views!